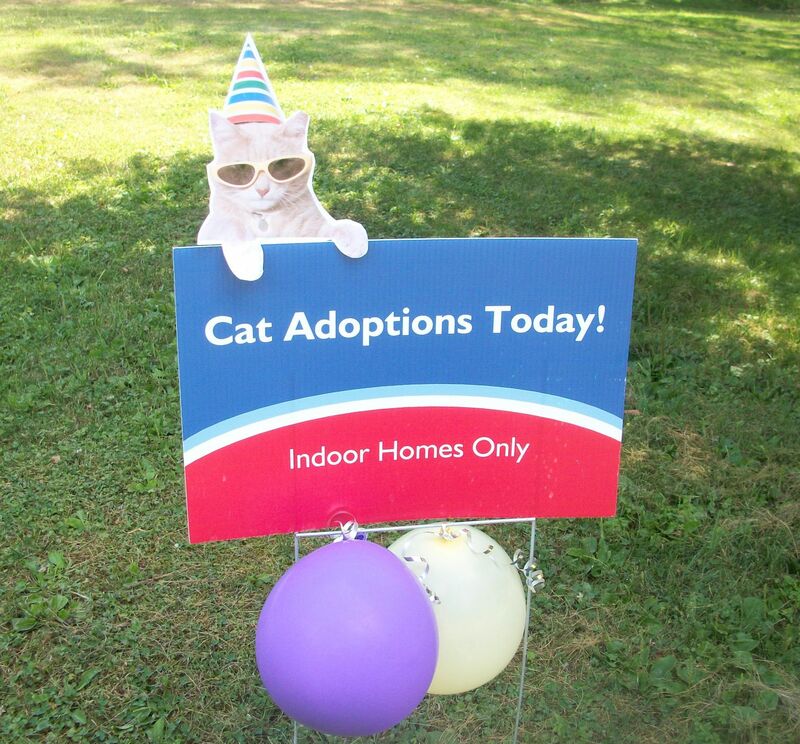 In one of the happiest happy ending stories from Petfinder’s 15th Birthday adoption event held two weeks ago on July, 16, a Spencer NY cat found his forever home after five years at Wildrun cat rescue. Susan Greene, who runs Wildrun cat rescue which is located in Spencer, decided at the last minute to participate in that Saturday’s Big Birthday Adoption Event adoption in honor of Petfinder’s 15th birthday. She made her own event RSVP only, to insure that potential adopters knew of her indoors-only requirement for adoption. Meanwhile, Jane from Petfinder posted TigerTom’s photo on Petfinder’s Facebook page and he got 843 “likes” and 83 comments. This tidbit confirms the enormous reach of Petfinder and their ability to showcase pets and make matches happen, as well as the usefulness of Facebook and the internet in general today in finding homes and help for companion animals. Tiger Tom arrived at Wildrun in 2005 and would love a forever home of his own. He is a favorite of ours and we dream of the day he gets his forever family. He is a handsome guy with a beautiful plush coat. He loves to be combed and petted. Tiger Tom makes silly little chirps when he chases that red dot from the laser pointer, and he is sure to provide comedic action in his new home. Why is he still here? Tiger Tom is afraid of visitors! Some days he is Mr. Charming. Other days he hides under a blanket and refuses to budge when visitors come to adopt. Those big beautiful eyes become scared, and people choose a kitten instead! With people he knows he is “front-and-center” asking for attention. But those strangers–oh my! Time to hide! 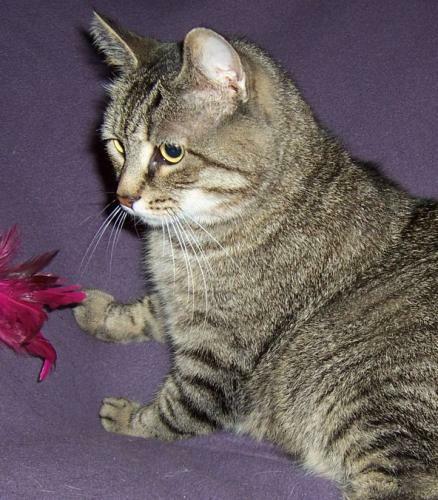 Tiger Tom is a joyful fellow who will make a quiet homeowner a faithful friend. He just needs that very special someone who will understand if he hides under the bed a few days before he comes out to snuggle. In response to their invitation to Wildrun’s adoption event, a couple named Georg and Jazz who had met TigerTom on a visit to the rescue a few years earlier, emailed to say they wanted to come out and adopt one of the long timers; they wanted a cat who had been repeatedly passed over as other cats found homes. TigerTom had been a shy cat, and Susan says the afternoon is a really bad time to visit the shy cats. “They all sit like lumps, hoping everyone will go away. TigerTom was no exception, but they chose him anyway.” I took some video of him that night so they could see that he really was, after dark anyway, a sweet cat. Here’s TigerTom’s “at ease” video, made to show his prospective adopters the wary cat’s true personality. 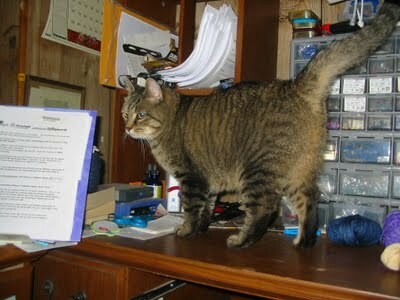 TigerToms’ next step was to move from the bathroom to the home office, and the shy boy who had lived at Wildrun for so long, came to really know life with his own home and family. Here’s a photo taken this week with Tiger out exploring in his new home. He is reportedly still a night owl, but is expected to transition to being more active during the day as he adjusts to his new way of life. 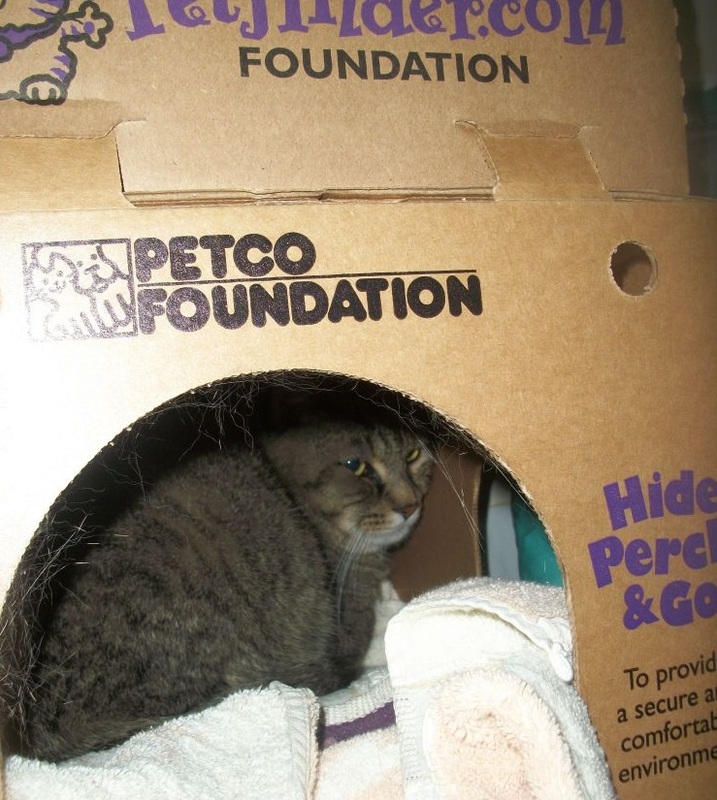 Thanks to Petfinder, thanks to Susan Greene and Wildrun, and thanks to TigrTom’s new parents, who wanted to give a home to an older cat who had waited a long time, this one cat now has a forever home. Thanks, also, to Susan for providing the photos and information for this story. She asked us to remind everyone that we can refine our Petfinder searches in various ways, including by age, so we can find those mature and senior cats and dogs who need us and who make such wonderful pets. 5 years? : ( I am glad he finally got parents furever. Elroy (see my avatar) is like TigerTom. He is wary of all strangers but with people he knows, he is all over them. I’m so glad TigerTom got a good home. Sometimes it takes a while for just the right person or family to connect with a certain animal. And this was Tiger Tom’s moment. I’m a vet. I always encourage people to adopt an adult, particularly the older ones who’ve lost their homes. They are great pets! TigerTom sure acts like he’s one of them! I bet he was an indoor kitty who didn’t meet other people or animals! How old is he? We do not have his exact age, Nancy, but he is described as adult, rather than senior. Such a big, handsome kitty! Glad he found his forever home! Ahhhhh, how wonderful for Spencer. He is sure a patient kitty, never giving up hope. He could teach us all a few lessons. (Smiling)!! In October 2010 I rescued a grey kitty who was living at my mechanic’s garage. They’d feed him their lunch, but they weren’t going to adopt him. They’re from Ecuador and named him Pancho. When it started to get cold, I knocked on nearby doors and determined that he’d lived in a restaurant down the street. When the place was sold, either he escaped or was abandoned. I examined him, vaccinated him, and gave him a heartworm pill. He has only a nubbin of a tail. On physical exam I determined he was born that way. He wiggles his little nubbin of a tail a lot. It’s very cute! I brought him into my house and he stayed in my room for two days. Then he moved to a room in the front of the house and was very defensive about my four other cats. If I was standing near him and a cat walked in the room, he’d attack me, so I learned to not stand too close. I couldn’t touch him for 2-1/2 years, so I never neutered him, which is okay, as he doesn’t spray. Then, a couple of months ago, all of a sudden, he decided he wanted to be petted and loved. He thinks he’s Top Dog! He’s a pip! I still can’t cut his nails though and he hasn’t figured out to keep his claws in – and they’re SHARP! His latest advance is to eat canned food that I put out on the kitchen counter in the morning. He goes to the dish after three of the cats, who eat together, are finished. He’s been doing that for the last few days. He’s steadily improving. He follows me around like a dog. Oh, and now he’s finally starting to eat roast beef that I get from the deli as a treat for the cats and The Puglet, who can’t walk and is a midget (Cutest Doggie Ever!). Puggy’s picture is on the first page of my website. Her eyes will make you melt! Her very interesting story is on the third page. Nancy, what a wonderful story! Our Tiger couldn’t keep his claws in either and wouldn’t let them be trimmed…. He scared us once at the vet when, in extreme fright because of the dogs, first rattled his cage, then, in an exam room, made human vowel sounds (sounded like he said “ee-ayyyyyyy”)…. I never heard any cat achieve human vocal sounds like that ever (other than the funny ones on YouTube) 🙂 ….. Sadly, we had to put Tiger to sleep at age 16/17 last January after learning he was dying of a heart condition. His behavior changed radically during the first week of this year and we had to take him to the vet. It was hard to say goodbye to such a sweet kitty. I petted him one last time when the vets had him in an incubator and he made an almost silent meow he’d make when tired. He knew it was me… He’ll always be missed. Thanks so much for featuring TigerTom! It really has been uplifting to see how many people have connected with his story. Nancy, he is about 7-8 years old. Visitors often felt like TigerTom actively disliked them because his expression is grumpy when he is nervous. He was always passed over for another cat or kitten. With volunteers who knew him, and people who visited in the evening, he was extremely affectionate. It’s clear he’s on his way to having a great life in a new home with people who will dote on him, and other cats to keep him company. All the well-wishes from readers here, on Facebook, and on the Petfinder blog have really given us a shot of energy! Thank you so much for sharing his story. I’ve found that the ones I’ve lost just serve to enhance the relationships with the ones that came after. It’s grossly unfair that we don’t even get twenty years with them. They should never get old; they should never get sick! So happy for tigertom to have humans of hin own, at last! That’s what every cat need.